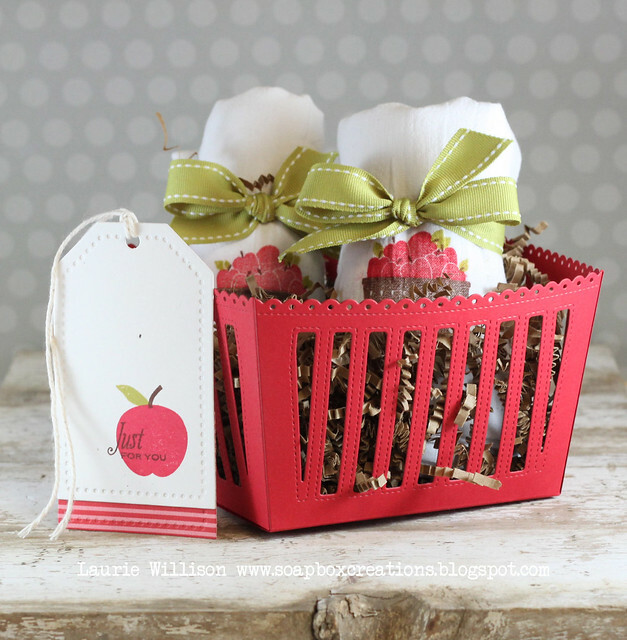 This gift includes 2 stamped tea towels, a matching card and tag. 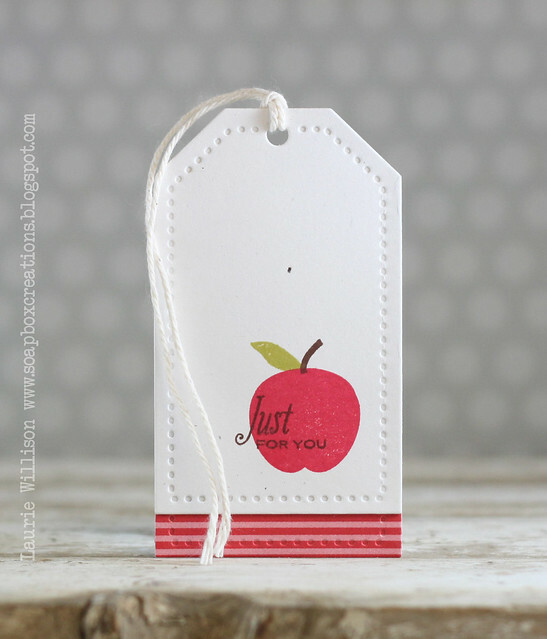 I stamped an apple from Teachers apple and added a little extension of Pure Poppy striped paper along the bottom. The sentiment comes for Bowl of Sunshine. I found a 2 pack of tea towels at Hobby Lobby and used a coupon so they were around $3 for the pair. I stamped the colander in Dark Chocolate, the apples in Pure Poppy, of course. I added stems and used the single leaf to add a few around the apples. Let's talk about this fun basket. It was so easy to put together! And the stitching details are so adorable. The bow is made from Simply Chartreuse Saddle Stitch. Very sweet little gift! 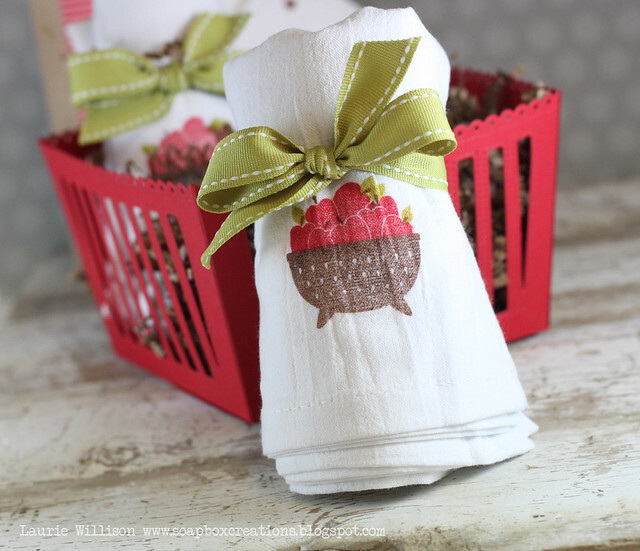 Great idea to stamp on the tea towels. LOVE!!! Oh, what a fabulous gift! Great job, Laurie! Beautiful! What a lovely and creative gift! 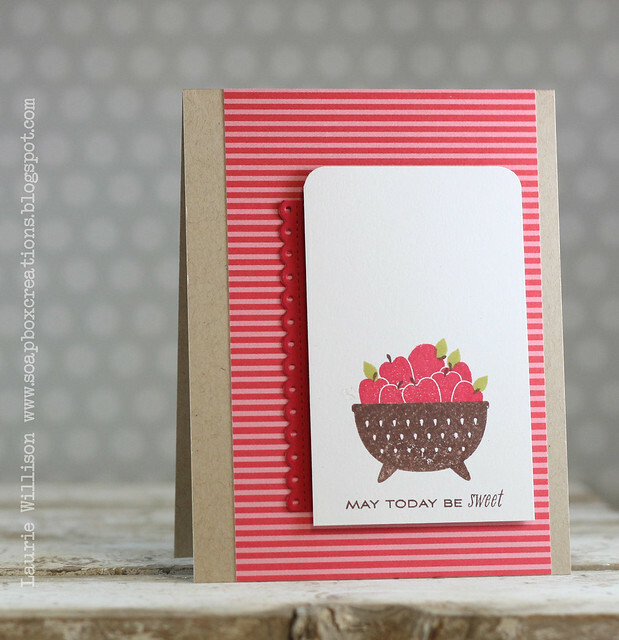 Love how you used a piece of the Berry Basket die as embellishment on a card! what a great way to extend the tag. gonna have to remember this. i think I will pin it so I don't forget! You clever gal, using the little scalloped border on your card! Love seeing ways to get multiple uses out of my supplies! Your project today is absolutely ADORABLE!! Absolutely darling gift and some of my favorite colors to boot! Adorable set! This is the perfect end-of-school teacher gift. Tour tea towels are sweet! Did you heat-set the die ink? (Am wondering how it holds up to laundering). Laurie fantastic project, I love your stamped tea towels. I love the whole project. such cute ideas. I have the same question as another person about the tea towels - do you know how they hold up to laundering? and did you heat set the stamp images? really could not be more delightful!! well done. Really cute, Laurie! You did an awesome job stamping on the fabric! Your presentation of the Bowl of Sunshine and Teachers Apple is fantastic along with your inspirational creativity. Thanks. 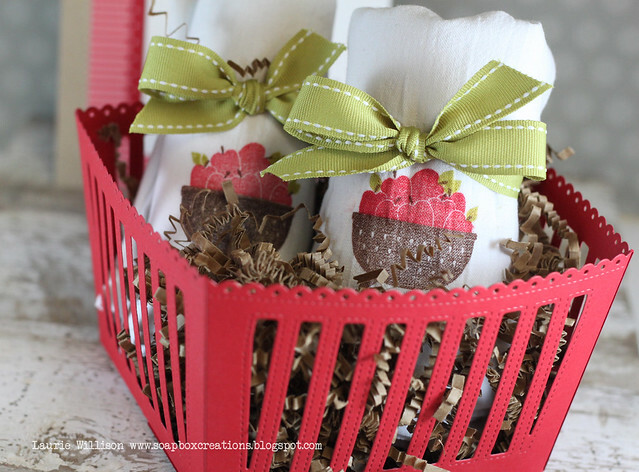 Super cute projects, Laurie! Love the basket in RED! So pretty in red! And love those towels. Great idea! Love your idea of the hand stamped tea towels,and they look darling in the basket. This is totally adorable!! I actually have white towels sitting in my craft room to decorate. I LOVE your idea!! This set would be perfect!!! And I love the basket!! How sweet are all of these?! !...Love them! Awesome gift with the stamped tea towels. Hoping you answer other's question regarding heat setting the ink, prewashing the towels or what needs to be done to save the stamping. Adorable gift idea! Clean, simple and classic designs. Beautiful! 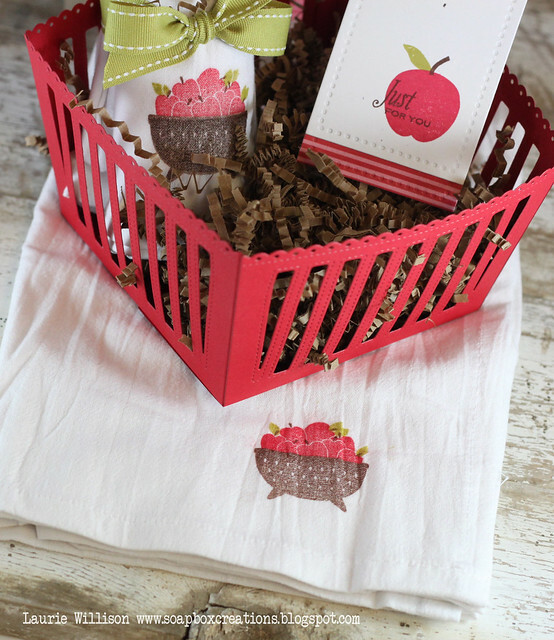 What a great ensemble...it's such a joy to see all the elements matching--cards, tags, basket! Just wonderful!